Allergic rhinitis (AR) and asthma are conditions most commonly affected with airway inflammation, and represent a global problem of public health affecting all age groups . The diagnosis of AR often precedes that of asthma. In fact, rhinitis is an independent risk factor, both in atopic and nonatopic individuals, for the subsequent development of asthma. Studies suggest bronchial hyper responsiveness as a common event in people with AR, even without asthma symptoms, and asymptomatic airway hyper responsiveness is associated with increased risk for developing asthma . Statistically, more than 50% of people with moderate to severe asthma also have chronic sinusitis indicating a direct connection between sinusitis and asthma; many studies show the connection between sinus infections and asthma . One 2006 study showed that when compared with those who only have asthma, people who have both sinusitis and asthma tend to have more severe asthma symptoms, may have more severe asthma flare ups, and are more likely to have disturbed sleep . Although the risk of developing sinusitis may not be the same for everyone with asthma, the same study showed sinusitis coupled with asthma was more common in women than men, and more common in Caucasian patients than any other racial groups [1,2,4]. Gastro-oesophageal reflux disease (GORD) and smoking may increase the risk of someone with asthma developing sinusitis, too. Studies also suggest the more severe a person’s asthma, the more debilitating the sinusitis, and people with severe asthma and sinusitis seem to make the asthma symptoms harder to control [1,2]. Clinical guidelines have become an important tool for providing recommendations diagnosing and treating several different medical conditions. Many of these guidelines help the process of decision-making for practitioners and contain an update of basic science in epidemiology. Within respiratory medicine, guidelines on asthma and rhinitis are available; however, they do not look at the patients globally and focus on the disorder on an organ specific basis without recommendations or comorbidities [5-7]. In 1999, the WHO (World Health Organization) and world experts created a report called ARIA (Allergic Rhinitis and its Impact on Asthma) which was published in 2001 [6,7]. ARIA's initiative in the master document has been endorsed by many national and international scientific societies and organizations, and used in to treat approximally 500 million affected patients globally . The aim is to educate and implement evidence based management of allergic rhinitis in conjunction with asthma worldwide. In the ARIA guidelines revision, 2008, the published supplement in the European Journal of Allergy and Clinical Immunology reviewing the latest scientific evidence on the definition of classification of rhinitis, risk factors mechanisms, and diagnosis and treatment with extensive citations in the scientific literature states in 6.9.2 "nasal obstruction is difficult to quantify directly by examination alone", so objective assessments such as acoustic rhinometry are used as an objective assessment . This specific guideline remains since the 2010 review and revision giving additional perspective on the use of various treatments for allergic rhinitis. ARIA, allergic rhinitis and its impact on asthma has not been developed only to update specialist an allergy/immunology, otorhinolaryngology and neumology on rhinitis and its comorbidities, but, also to provide recommendations for respiratory specialists and nonspecialist such as GPs [3,6]. Other studies demonstrate the relevance of rhinometry as a valuable tool enhancing the assessment of nasal patency and better understanding nasal and respiratory physiology [4,8-11]. In recent years, increasing evidence has been provided on frequent simultaneous coexistence of inflammatory diseases and allergies in upper and lower airways [2,4,6,12]. To achieve a good standard of measurement of upper airways, an objective method should be used. In a study published in Respiratory Medicine (2003), Numminen et al. evaluated the reliability of acoustic rhinometry (AR) using computer tomography (CT) . A total of 48 nasal cavities with nasal stuffiness associated with chronic sinusitis were measured with acoustic rhinometry (AR) and High-resolution computer tomography volumetry (HRCTV) . Comparison of volumes and minimum cross-sectional areas measured with these methods was performed. The volumes measured from the nostril with both methods were the anterior (0-10 mm), middle (11-40 mm) and posterior (41-70 mm) volumes . The AR cross-sectional area curve was analyzed based on two minimal notches corresponding to local minimal areas. A series of 1-mm coronal CT images without intervening gaps were made and analyzed based on two minimal voxel values, which were later converted to cross-sectional areas corresponding to local, minimum cross-sectional areas (MCA) . Furthermore, the distances of these 2 MCAs from the nostril were also measured. Strong statistically significant (P<0.05) correlations were found between acoustic rhinometry (AR) and computer tomography volumetry (CTV) volumes in the anterior (r = 0.83) and middle (r = 0.77) parts of the nasal cavity. In the posterior part of the nasal cavity, a statistically significant (P <0.05) correlation was also found (r= 0.62) . Good agreements between the AR and CTV volumes in the anterior and middle parts of the nasal cavities were confirmed with Bland–Altman plots [11,12]. Correlations among the MCAs were weaker (r = 0.59 and r = 0.55). The results suggest that the reliability of AR appears sufficient for clinical and scientific use in the nasal cavities [4,8-11, 13,14]. The World Allergy Organization recognized acoustic rhinometry as a protocol, monitoring, control measure in Nasal Provocation Tests (NPTs) which are used as an indicator in confirming clinically relevant allergy and in the diagnosis of allergic rhinitis . According to the published dP NPT protocol, it showed to have good specificity and sensitivity to discriminate patients with allergic rhinitis from controls monitored by Acoustic Rhinometry (AR) and nasal symptom score in children and adolescents [11,15]. Specific measurements that are performed before and after the application of a nasal decongestant spray, such as in the case of allergic rhinitis, the differences in cross-sectional diameter of the nose can be attributed to nasal mucosal congestion. Data obtained after nasal decongestion allow the evaluation of anatomical factors influencing the cross-sectional diameter of the nose with the use of Acoustic Rhinometry . These findings were presented at the American Academy of Allergy, Asthma, Immunology, February 2015. In a report prepared by the European Academy of Allergy and Clinical Immunology Task Force on allergic rhinitis comorbidities, published May 2017 in the Journal of Clinical and Translational Allergy, Cigni et al. discussed asthma at the extent of co-occurrence with allergic rhinitis (AR) . In a study of over 20,000 children, a study showed the co-occurrence of allergies and AR noticed in the same child was more frequent than expected then if they were their own independent entities. Cingi et al. extrapolate the possible causal mechanisms that link allergic rhinitis and asthma, defining the presence of rhinitis as a risk factor for subsequent asthma development. When diagnosing the multi morbidities associated with allergic rhinitis, acoustic rhinometry is listed as a recommendation to define the signs and symptoms of turbinate hypertrophy, to show whether mucosal lining or bony structure is responsible for an obstruction in the upper respiratory airway . Several objective methods of evaluating these obstructions have been devised in the recent decades. The most common been rhinomanometry; however, although it established a niche in ENT, it is not found with widespread acceptance and reimbursement in the routine clinic. This is due to the time it takes to carry out the task, the degree of cooperation required, and the inability to generate satisfactory traces in many subjects such as young children, and the realization that nasal resistant often bears little relation to the patient's subjective sensation a blockage . Acoustic rhinometry, introduced two decades ago for assessment of the nasal airways of adults, was developed as a means of evaluating nasal geometry by utilizing acoustic reflection of sound introduced into the nostrils [8-10]. Researchers found the estimation of nasal cavity cross-sectional area and volume correlated with direct measures produced in cadavers . The acoustic rhinometer generates an acoustic wave which is transmitted through a tube into one nostril [10,16]. The size and the pattern of the reflected sound waves provide information on the structure and dimensions of the nasal cavity, with the time delay of reflections correlating with the distance from the nostril [10,16] (Figure 1). The conversion of echo measurements to nasal volume requires mathematical calculations and theoretical assumptions, which is done by the computer connected to the recording device. In a congested nose, or in the nose with nasal polyps or tumor, the narrowest points are located deeper in nasal cavity, and acoustic rhinometry can detect the position of this point; however, cannot differentiate what is the blocking factor. It is an easy and non-painful procedure to perform. The patient sits in upright position, clears its' nose and places the nosepiece against the nostril. The room where acoustic rhinometry is performed should be standardized in terms of temperature and humidity. Silence during measurement is essential. The nosepiece should fit the nostril, ensuring an airtight seal. Measurements are performed during breath holding. Valid AR measurements can be obtained in a few seconds and require minimal co-operation . Acoustic rhinometry (AR), has several attractive features relevant to application in a pediatric population. Its non-invasive nature, simplicity and rapidity are prime assets when examining infants and small children. The correlations found between AR and adenoid size scores on NE indicate that AR continues to provide adequate assessment of the adenoid size in symptomatic children, although this correlation was only found to be valid after nasal decongestion . This is also in agreement with several studies that had found significant improvement in AR variables after adenoidectomy. In conclusion, “very strong correlation was found between the anterior nasal cross-sectional area calculated from the radiographs, and the anterior nasal cross-sectional area and nasal volume from the rhinometer. Acoustic rhinometry can be used also to check the impact of long-term medical treatment on nasal blockage due to rhinitis, rhinosinusitis or nasal polyposis which 7% of asthma patients It can measure the volume of nasal cavities helping in objective evaluation of nasal polyp size reduction after medical treatment, or post TCRF due to turbinate hypertrophy . Specific challenge tests based on the application of allergen onto the nasal mucosa in the allergic patient may show extent of congestion by showing reduced nasal volume; however, it should be stated that acoustic rhinometry, as well as rhinomanometry, data on nasal patency do not correlate well with patients’ subjective perception on nasal blockage . In a 2012  study looking at the intersession repeatability of acoustic rhinometry measurements in healthy volunteers, twenty healthy volunteers were studied. In each subject, acoustic rhinometry measurements were performed on five consecutive days, with multiple recordings. Five clinically relevant parameters were measured in each session and the intersession repeatability of these measurements was expressed in terms of mean coefficient of variation, intraclass correlation coefficient and inter-item correlations. Al Ahmari  assessed five important acoustic rhinometry variables and examined separately to test the intersession repeatability of the technique: outermost minimum cross-sectional area (MCA1, cm2), the distance of MCA1 from the nasal orifice (D-MCA1, cm), innermost minimum cross-sectional area (MCA2, cm2), the distance of MCA2 from the nasal orifice (D-MCA2, cm), and the volume of the nasal segment between the 2nd and 5th cm from the nasal orifice (V2-5, cm3). MCA1 corresponds to the level of nasal valve, whereas MCA2 corresponds to the anterior half of inferior turbinate . In each subject on each day, areas, distances and volume values for each separate nostril were averaged (mean), whereas combined values were obtained by calculating the mean of the mean results from the right and left nostrils to correct for the variation between nostrils during the nasal cycle . 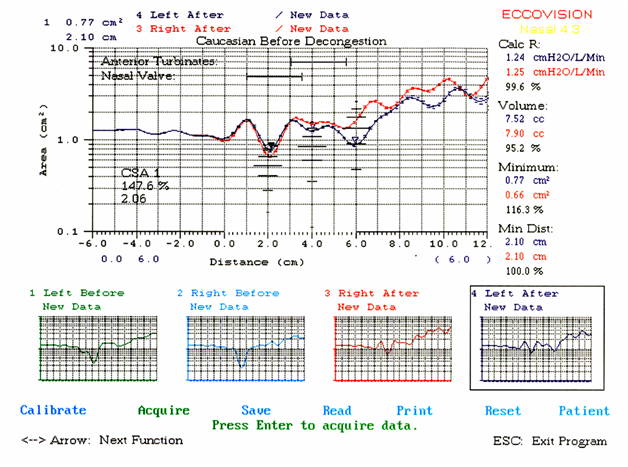 Figure 1: Data from Eccovision test is displayed on an easy-to-read graph. This is the first study to examine the intersession repeatability of acoustic rhinometry using intraclass correlation coefficients on averaged combined and separate nostril minimum cross-sectional areas and nasal volumes . The study showed that acoustic rhinometry provides excellent reproducible results, best over different sessions when combined nasal parameters values are used than right or left nostrils separately. This degree of repeatability has clinical implications with regard to the utilization of this rapid and easy-to-use technique in the follow-up of conditions associated with impaired nasal patency. In conclusion, acoustic rhinometry provides highly repeatable measurements of nasal patency, which is best for combined (mean) nasal parameters. This property makes it suitable for use in the diagnosis and follow-up of conditions associated with nasal obstruction, either structural or functional. Studies have shown a direct connection between sinus infections caused by allergic rhinitis and asthma, suggesting the bronchial hyper responsiveness as a common event increasing the risk for developing asthma. Several health organizations and professional societies classify these multi-morbidities associated with allergic rhinitis, together, and provide recommendations for diagnosis and treatment. Amongst those recommendations is acoustic rhinometry to define the signs and symptoms of turbinate hypertrophy, and to show weather mucosal lining or bony structure is responsible for an obstruction in the upper respiratory airway. Acoustic rhinometry continues to prove useful as an objective test for evaluating nasal obstruction with several advantages over alternative techniques. It has also been established in rhinology and allergy, and continues to be a promising clinical tool in specialties such and pulmonology, sleep, and plastic surgery, particularly in the pediatric age group. Guerra S, Sherrill DL, Martinez FD, Barbee RA (2002) Rhinitis as an independent risk factor for adult-onset asthma. J Allergy Clin Immunol 109(3): 419-425. Jeffery PK, Haahtela T (2006) Allergic rhinitis and asthma: inflammation in a one airway condition. BMC Pulm Med 6(Suppl 1): S5-S10. Cingi C, Gevaert P, Mösges R, Rondon C, Hox V, et al. (2017) Multi-morbidities of allergic rhinitis in adults: European Academy of Allergy and Clinical Immunology Task Force Report. Clin Transl Allergy 7: 17. Fokkens WJ, Lund VJ, Mullol J, Bachert C, Alobid I, et al. (2012) European Position paper on rhinosinusitis and nasal polyps 2012. Rhinol Suppl 50(1): 1-12. Baena-Cagnani CE, Sánchez-Borges M, Zernotti ME, Larenas-Linnemann D, Cruz AA, et al. (2013) [ARIA (Allergic Rhinitis and its Impact on Asthma). Achievements in 10 years and future needs in Latin America]. Rev Alerg Mex 60(4): 184-192. Bousquet JL, Khaltaev N, Cruz AA , Denburg J, Fokkens WJ, et al. (2008) Allergic Rhinitis and its Impact on Asthma (ARIA) 2008 update (in collaboration with the World Health Organization, GA(2)LEN and AllerGen). Allergy 63(Suppl 86): 8-160. Bousquet JL, Schünemann HJ, Samolinski B, Demoly P, Baena-Cagnani CE, et al. (2012) Allergic Rhinitis and its Impact on Asthma (ARIA): achievements in 10 years and future needs. J Allergy Clin Immunol 130(5): 1049-62.
de Oliveira Camargo Gomes A, Martins Sampaio-Teixeira AC, Kiemle Trindade SH, Kiemle Trindade IE (2008) Nasal cavity geometry of healthy adults assessed using acoustic rhinometry. Rev Bras Otorrinolaringol 74(5): 746-54. Elbrond O, Hilberg O, Felding JU (1991) Acoustic Rhinometry: a new method to evaluate the geometry of the nasal cavity and the epipharynx. Am J Rhinology 5(1): 7-9. Hilberg O, Jackson AC, Swift DL, Pedersen O (1989) Acoustic rhinometry: evaluation of nasal cavity geometry by acoustic reflection. J Appl Physiol 66(1): 295-303. Numminen J, Dastidar P, Heinonen T, Karhuketo T, Rautiainen M (2003) Reliability of acoustic rhinometry. Respiratory Medicine 97(4): 421-427. Giavarina D (2015) Understanding Bland Altman analysis. Biochem Med (Zagreb) 25(2): 141-51. Al Ahmari M (2012) Intersession repeatability of acoustic rhinometry measurements in healthy volunteers. Clinical and Experimental Otorhinolaryngology 5(3): 156-160. Zakia R, Bulgibaa A, AzinaIsmail N (2013) Testing the agreement of medical instruments: Overestimation of bias in the Bland–Altman analysis. Prev Med 57: S80-S82. Matsumoto F, Wandalsen G, Sole D (2015) Specific nasal provocation test with dermatophagoides pteronyssinus monitored by acoustic rhinometry in children and adolescents with allergic rhinitis and controls. World Allergy Organization Journal 8(1): A179.